The Crowne Plaza SFO, is home to premier SFO Parking. 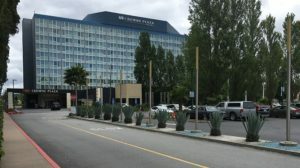 Situated right next to bayside park in Burlingame, you’re greeted with a picturesque view of the Bay Area upon arrival. Book your airport parking reservation with snag a space as you fly from San Francisco International Airport. In addition to cheap long term parking and a close proximity to the airport, what more could you want when looking for San Francisco airport parking? Whether you are leaving on an overnight business trip or you need long term parking for your vacation we have you covered! Still looking for more from your SFO Airport parking provider? How about the option to select either self-parking or covered valet airport parking, performed by highly trained Guest Service Associates? snag a space offers both! Crowne Plaza SFO Airport also offers complimentary shuttle service to and from San Francisco Airport & BART. If you have worked up an appetite over the course of your travels, the hotel has many options, West Bay Cafe, as well as West Bay Express on location! It is required that you book your airport parking reservation in advance in order to receive this discounted rate. Pre-book your SFO parking with snag a space! SFO Parking shuttles operate every 30 minutes between 4:00am and 1:00am daily.